KMB4: kit of zener barriers for hazardous areas. 3 zener barriers for load cell supply, signal, and sense. Suitable for mounting on a DIN bar in a safe area, or in a hazardous-proof case (Exd) in an ATEX area. 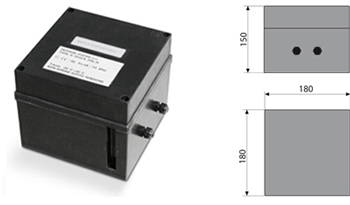 Kit of three intrinsic protection Zener barriers, for connection of devices in ATEX area with devices in safe area, housed in an ABS box. Marking of single barrier: ATEX II (1) GD [Ex ia Ga] IIC [Ex ia Da] IIIC. ATEX II 3(1)D Ex tb [ia Da] IIIC T130°C Dc IP65 (-20°C ≤ Ta ≤ +40°C) for dust. 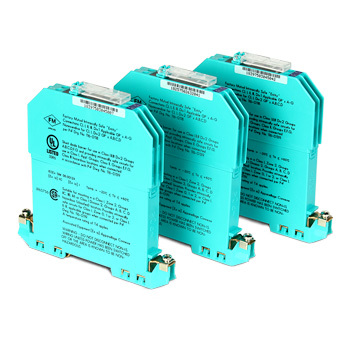 - Connection with up to 4 load cells of 350 ohm each. - The combination of two or more Zener barriers (1) GD [Ex ia] implies that the Atex marking of the barriers assembly must be update to (2) GD [Ex ib], as required by the EN 60079-14 standard. The KMB4 kit can be placed in ATEX zone according to its ATEX marking or in alternative in a safe area. The electric coordination, executed for realizing the DCATEXMB4 certificate, involves the use of the LCCB/EXCB6 cable, maximum length of 200m (greater lengths upon price estimate). Dini Argeo non Atex indicator and KMB4 box in safe area, connected to the Dini Argeo ATEX platform in hazardous area. The system is provided with declaration of ATEX conformity (code DCATEXMB4). 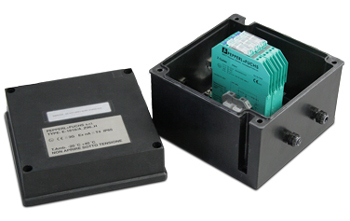 DFWATEX3GD Dini Argeo indicator and KMB4 box in ATEX 2 & 22 areas, connected to the Dini Argeo ATEX platform in ATEX 1 & 21 areas. The system is provided with declaration of ATEX conformity (code DCATEXMB4). ZBPW Intrinsic protection Zener barrier for load cell supply, for mounting on DIN bar in a safe area, or in a hazardous-proof case. Marking: ATEX II (1) GD [Ex ia Ga] IIC [Ex ia Da] IIIC. ZBSG Intrinsic protection Zener barrier for load cell signal, for mounting on DIN bar in a safe area, or in a hazardous-proof case. Marking: ATEX II (1) GD [Ex ia Ga] IIC [Ex ia Da] IIIC. ZBSN Intrinsic protection Zener barrier for load cell sense, for mounting on DIN bar in a safe area, or in a hazardous-proof case. Marking: ATEX II (1) GD [Ex ia Ga] IIC [Ex ia Da] IIIC.